Greeks want their money. Who can blame them? But why did they foolishly have money in the bank in the first place? Regardless, the banks are open. And huge lines are forming. In a knick-knack paddywack maneuver to boost morale, the Troika graciously allows depositors to withdraw €420 euros at a time, up from the previous €60. Alas, the weekly withdrawal rate remains the same €420 euros. Greek banks will open for the first time in three weeks on Monday in an attempt to boost savers’ confidence in the country’s crippled lenders. The reopening of the banks, which were collectively down to their last €1bn in available cash last week, represents a morale-boosting step for the crisis-racked country. However, potential bail-ins of depositors and loan defaults still loom for a sector hit by capital controls and an extended bank holiday as it scrambled to avert bankruptcy. Last week the European Central Bank agreed to inject €900m worth of fresh liquidity into Greek banks, taking its emergency liquidity assistance to the country to €89.9bn. But one leading Greek banking executive said that banks had planned to open on Monday regardless of the injection, even if that meant having no cash behind the desks. “A great deal of it is for morale,” said the executive. Morale Boost with No Money? Supposedly, there was going to be a morale boost if banks opened with no money. Anyone really believe that? Huge queues are not morale boosting either. 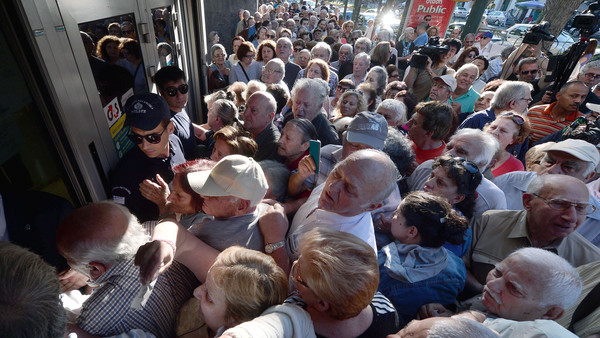 The key morale boosting move is making Greeks stand in line only once a week rather than seven times a week to get the same measly amount of money. Nonetheless, this is a genuine productivity boost. Shhh. Don't tell the economists, or they will figure out a way to up GDP estimates.